Update January 20, 2015- The PBS news show Frontline has been tracking the number of head injuries in the NFL. The new rules changes that try to eliminate head to head tackling seem to be working. Concussions are down 19% in 2014 over 2013. They are down 28% since 2012 season. In 2010, before the NFL made the rules changes, we wrote the blueprint for the solution. See below. Serious head injury in American football is commonplace and has received national attention within the last two years. Last season, star quarterback for the Florida Gators and Heisman Trophy winner, Tim Tebow, suffered yet another concussion that was witnessed by millions of sports fans, as did Super Bowl champ Ben Roethlisberger and many others. Bryant Gumbel of HBO’s Real Sports was an import factor in bringing this problem to the mainstream. As a result of his show and subsequent coverage in the press, the NFL was pressured to make changes. There is now a mandatory time-off for players suffering concussion, and new posters have been placed in locker rooms. The concern is extending to off-the-field injuries as well. In 2009, then Tonight Show host Conan O’Brien gave head injury more national attention with his on-air concussion. A recent study commissioned by the NFL found an astonishingly greater prevalence of Alzheimer’s-like memory loss in ex-NFL players. Young athletes in high school or lower grades are even more vulnerable to permanent brain damage after the initial concussion than adults. In addition, there is now new credible evidence from the same scientists at Boston University that Amyotrophic Lateral Sclerosis, ALS, also known as Lou Gehrig’s disease, is caused by head injury. 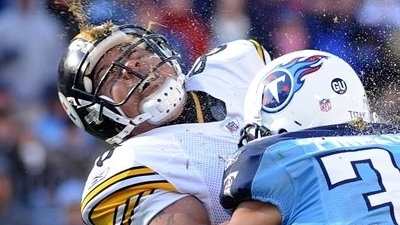 Concussions are one of the dirty secrets of football. What can be done to make America’s favorite sport safer? The cause of the vast majority of concussions in football is the lack of enforcement of the rules dictating proper tackling and blocking. The helmet is currently used as the primary ramming tool, particularly at the higher levels, when in fact the facemask and helmet should theoretically never be used in contact. It is against the rules for a defensive player to dip his head and tackle headfirst with his helmet. On the offense, a proper block should use the arms and hands as the initial point of contact, and runners should not dip down and ram headfirst. In reality, however, virtually every block on the interior line and every running play uses the facemask and helmet as battering rams. It would be quite feasible to enforce the existing rules of football that dictate the helmet should not be used as a weapon and the quality of play as seen by the spectator would not be diminished. Running backs should run with their facemasks up at all times. If a running back were to dip his head and spear forward, it should be a 15-yard penalty and loss of down. Likewise, offensive and defensive linemen should be penalized if their helmets clash. The ground collisions with helmeted heads that cause injury cannot be easily prevented. However, a simple enforcement of the blocking, tackling, and running rules should eliminate a significant portion of the head (and spine) injuries in football. Also, preventing the premature return of head injured players will help reduce further injury as well. Hines Ward of the Pittsburgh Steelers can lay out some the most vicious and entertaining blocks in all of football just by using his shoulder pads. Using the helmet as a weapon is cheating, unnecessary, and should be banned. This entry was posted in - Opinion, - Policy, Neurosurgery, Primary care medicine, Psychology Psychiatry, Spine surgery, Sports medicine. Bookmark the permalink.